Caring for disabled birds is not all that hard it just requires a little more thought, especially when designing a living area. Birds adapt very easily to disablilities, much better than humans, and can live long happy lives without ever knowing what they were missing. Cripples are probably the most common type of disabled birds. There are lots of causes: splayed legs, deficiencies, accidents, fights, malposition in the egg and arthritis. Cripples are fairly easy to care for. 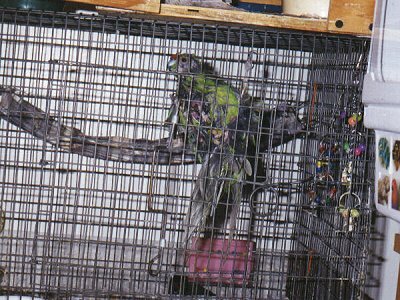 Cages can be furnished with wide, flat perches set near the bottom, ramps and hammocks. There should be plenty of horizontal bars to allow the bird to climb around with it's beak and the cage should be short enough so that when the bird falls (and it will) it won't be injured. Wings should be clipped because crippled birds often try to fly (emphasis on the word "try") and can injury themselves further with their lack of control. Also many will trip over their flight feathers. No deep dishes should be allowed since birds can get trapped in them or drown if it holds water. A shallow bowl (I use a tupperware lid) can be used for bathing and a water bottle can be provided for drinking. Occationally birds do go blind. This can be due to old age, tumors or an actual injury to the eye. The main thing to keep in mind with blind birds is that everything must remain in the same place so they can easily find it. Food and water dishes, perches and toys cannot be rearranged. Blind birds can be kept with others as long as they are in no danger but I wouldn't recommend it. 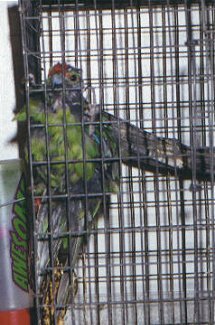 I once had a budgie in a cage with 3 other birds get a tumor which pinched her optic nerve. She went blind but could still be housed with the others as long as she knew where everything was. Her husband looked after her. Flights are a no no since the bird could fall if startled and will refuse to fly. Probably the saddest injury you will find is in bird with no beak. Beaks can be lost through trauma. Cages may have to be designed somewhat like with crippled birds because beakless birds will have a hard time climbing around. Food must be soft and able to be digested without hulling or grinding. These guys should be kept alone (unless they have a VERY passive mate/buddy) as they have no way of defending themselves. Toe injuries are very common and I hardly consider them a disablility. Birds missing toes or toenails may have weakened gripping power but they generally do perfectly fine without extra help. Broken wings are not always able to be fixed and the joints will fuse together inhibiting the bird from stretching its wing. This type of disablility isn't too bad if you always remember these guys can't fly. The wings may not even have to be clipped. Diabetics, birds on medication or with chronic illnesses often have it the worst just because they may require daily stressful care like shots. Each illness will have it's own set of special requirements so ask your vet about the options. is owned by Feisty Feathers.